On 11 November 2013, a man was seriously injured when a Genting-bound bus skidded and crashed into a drain. 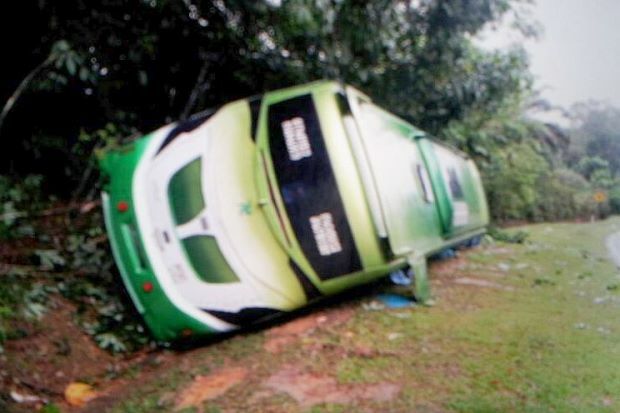 A bus carrying 22 passengers to Genting Highlands overturned along Jalan Batang Kali early Monday, injuring one passenger. Selangor Fire and Rescue Department’s operations assistant director, Mohamad Sani Harul said they received an emergency call at 5.07am and the rescue team reached the scene of the crash 24 minutes later. He added that the distress call was received at 5.07am this morning, and the fire truck deployed had arrived at the location at 5.31am. The operation, Sani said, ended about an hour later at 6.28am. 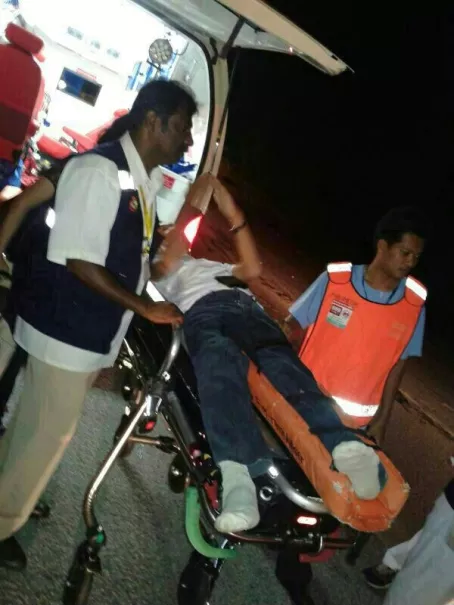 Hulu Selangor deputy police chief, DSP Zulkifli Bidin when contacted said the 58-year-old victim who suffered a broken right leg and had to be extricated from the bus in the 5am accident was now being treated at Selayang Hospital. 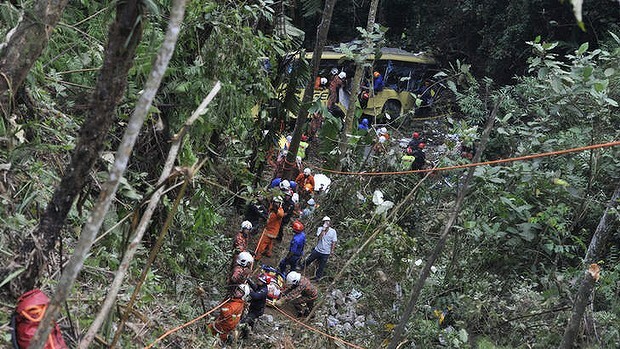 The injured passenger who was later identified as Chong Ah Seong, 58, was transported to the Kuala Kubu Baru. "We managed to rescue those inside the bus around 6.30am. All the other passengers escaped with only minor injuries," he said. He said the bus driver and a number of passengers had slight injuries. Police sources said the bus driver was forced to swerve to avoid colliding with a car that was travelling in the wrong lane along KM3 of the road, around 5am. As a result, he lost control of the vehicle, which overturned in a drain by the roadside. According to him, it was drizzling when the accident happened after the bus driver tried to avoid a car coming from the opposite direction which had veered into his lane. 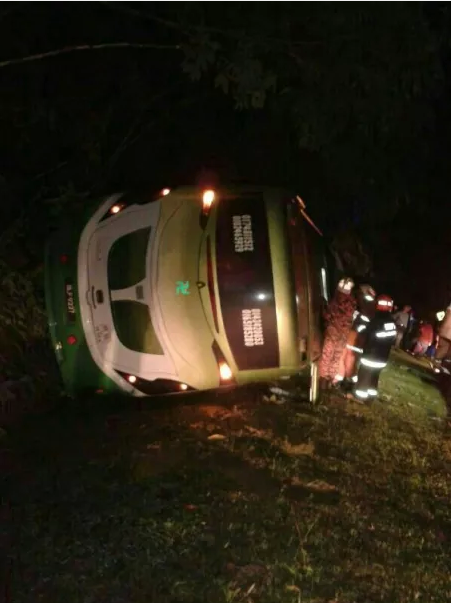 He said this caused the bus, which was on its way to Genting Highlands from the federal capital, to skid and crash into the drain, adding that the bus passengers were all locals. He said the weather had been fair, although the road was dark as there were no street lights. The accident is being investigated under Section 43(1) of the Road Transport Act 1987 for careless driving.